Before I talk about Dominant White, it might be helpful to pull one of the archived posts from my studio blog. I still need to finish pulling the posts that deal with horse color over here to the Tapestry blog, but since this one is relevant I’ll repost it now. One of the downsides to publishing your theories is that you stand the chance of later being proven wrong. Or at least missing the mark by a bit. Ten years ago I wrote an article entitled “A Study of White Horses – Not What They Seem“, where I questioned the existence of Dominant White in horses. My skepticism was based on my own research into the backgrounds of as many white-born horses as I could find. From that I came to believe that most of the horses designated as Dominant White were more likely to be extremely marked sabinos. 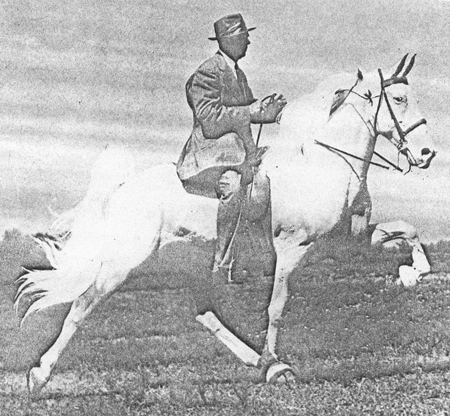 I failed to find horses that fit the profile for Dominant White, so I began to suspect that the color did not exist – or perhaps no longer existed since there were anecdotal stories of horses that had fit the profile in times past. Other things are in the works, too. A Swedish team found the mutation for grey, though a test is not yet available. 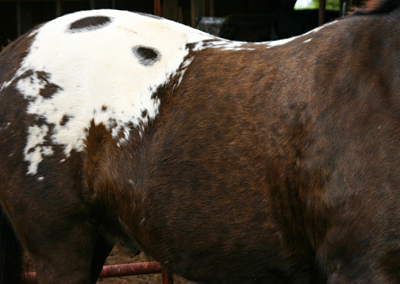 UC Davis has been working on dun, and of course there is the ongoing research on the appaloosa patterns. Pretty soon there won’t be anything left to guess about when it comes to horse colors! Given the breeding records of the aforementioned “white” horses, I have come to wonder if Dominant White really does exist. 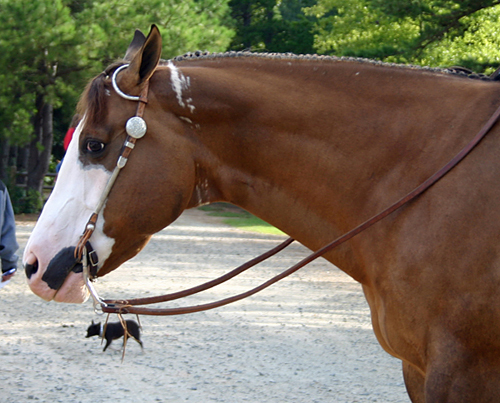 But it is clear that even if it does, the majority of white-born horses are probably sabino whites. Much of the research for the original article was done between 1992 and 1995, when I had access to the archives at the Tennessee Walking Horse Breeders’ and Exhibitors’ Association. Looking through old show catalogs and registry records, I found a lot of horses that looked like the horse above, Silver Sultan. (Photo from the TWHBEA archives) Even more were recorded in the early stud books. 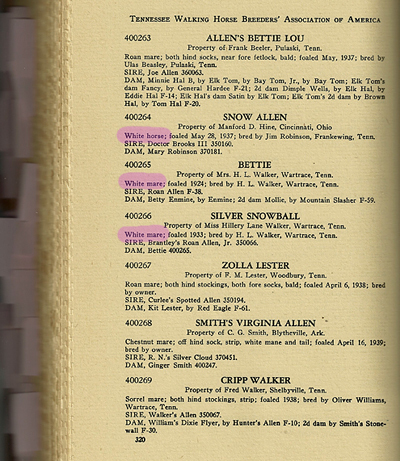 I had a complete set of Walking Horse stud books, which were a gold mine of information because breeders submitted (and the registry printed) detailed color descriptions. Because I was interested in how sabino might work, I developed an elaborate numerical system for evaluating just how much white the horse had, and then set about assessing how horses with different amounts of white produced when crossed with mates with differing amounts of white. In hindsight, it was probably far less useful than the time spent justified! But the one take-away was that the white horses all had two sabino parents, and in almost all cases the numerical value of the parents was pretty high. The way I scored the horses actually skewed this, because I grew up in the Tennessee Valley and I knew that many horsemen called a horse with indistinct body spotting “roan”. Taking that into account, if the horse had enough points based on markings – if I could be pretty sure it was not a dark-headed roan – then it got extra points if roan was used in the description. Many of the horses probably didn’t have body spots, or at least weren’t as patterned as their number value would suggest, but I was weighing a trait that was tied to the white even if I didn’t know it at the time. That is because the gene that causes sabino-white, Sabino1, tends to produce really roany horses, even when they are not very spotted. This old-fashioned Walking Horse mare is a good example. Finding that link between white-born horses and sabino in both parents was why I wrote the article. Still, there were horses that did not fit my theory. In the article I speculated that in some breeds sabino might be linked in some way to the chestnut gene. There was no apparent link in the Walking Horses, which inherited spotting without any real difference related to base color that I could tell. I did know, though, that in some breeds (like Arabians) there was a noticeable difference in the amount of white a chestnut horse might inherit compared to a bay or black horse. I wondered at the time if this might play a role in the white-born horses that had parents with low numerical values (ie., little to no white), since in most of those cases the parents were bay or brown. The biggest limitation was that most of the white-born horses I could find were long gone, and in many cases only partial records remained. I published what I had, and hoped that the article might flush out a bit more information. If your heart is truly in research, you really do want those corrections, because where you are wrong is where you learn. My correction didn’t come for another ten years, but it did come. Almost all the horses that didn’t fit my theory quite exactly right were found to be Dominant White. R Khasper. White Beauty. Puchilingui. Those that weren’t in the study fit the pattern for being Dominant White. Tomorrow I will post pictures of Sato, the palomino Dominant White Thoroughbred stallion from one of those identified families. I was fortunate enough to see him in person in Kentucky, and talk to his owner, April Wayenberg. He is particularly interesting because he is more colored than a lot of Dominant Whites. He is also extremely photogenic, so I took hundreds of photos. In a post last week, I mentioned that I was sending a hair sample from my appaloosa mare to UC Davis, in order to find out what color she truly was. Underneath her white pattern, the base color was an odd brown shade. 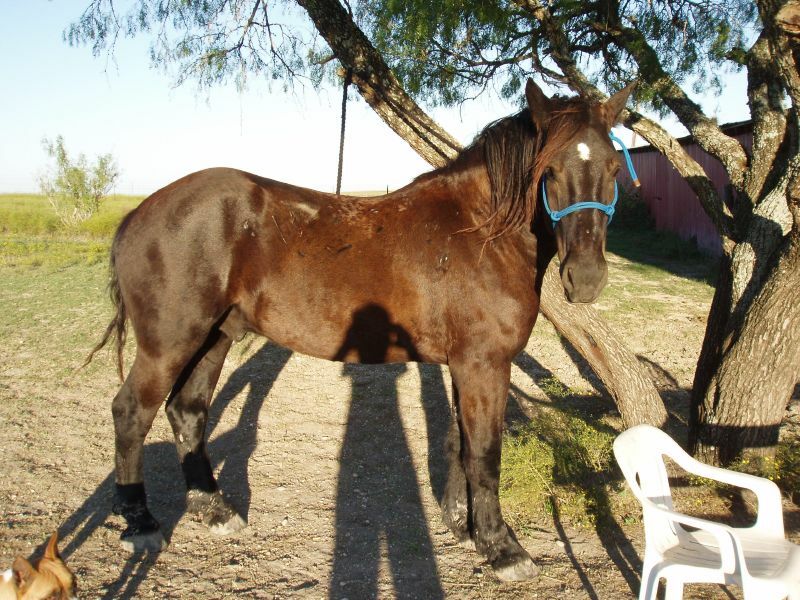 I found over time that most horse people were inclined to call her black, but her lower legs were tan. Typically when black horses fade in the sun, their lower legs retain color in the same area that is black on a bay horse. This Percheron is a good example. He looks bay, but genetic tests show him to be black. That is why the hair above the hoof is often a good indicator for determining if the horse is faded black or a liver chestnut. The hair on my horse’s lower legs was most definitely not black. If anything, it has always been the palest area of color on her, as this winter picture of the back of her leg shows. So it would be reasonable to believe she was chestnut. Still, to someone who looks at color a lot, there was something “off” in the tone for her to be chestnut. Certainly some chestnuts are a rather dull color, but the tone was enough for me to suspect she was some kind of dilute. 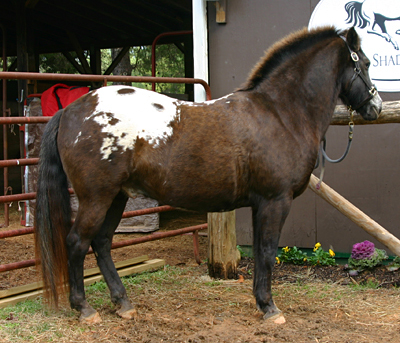 Recent studies on the appaloosa patterns had shown that many black appaloosas had their color altered, and I had long noted that many appaloosas had base colors that were just hard to pin down as any specific thing. I suspected that this was what was going on with Sprinkles, but without a test I couldn’t really be sure. Yesterday I received her test results, and my guess was right. She is “aa” – genetically black. She carries the chestnut gene (e) but is not herself chestnut. With that in mind, I thought it might be fun to post a group of photos showing some lower legs and the difference in tone between some of the colors. This is the kind of thing that artists need to keep in mind when painting different colors, because getting the tone right makes all the difference in portraying a given color. One caveat though. Photographs are not the best way to really see these differences. All the ways we record and transmit images (film, printing, monitors) can distort color, and with something like this what we are dealing with are very subtle differences in tone. These are my own images, taken with the same equipment in close proximity to one another, but still viewing these colors in real life (preferrably side-by-side) is the best way to see. Indeed, the tone in color is really best studied from life because the camera rarely captures what is so obvious in person. But we will do the best we can with what is possible over the internet! 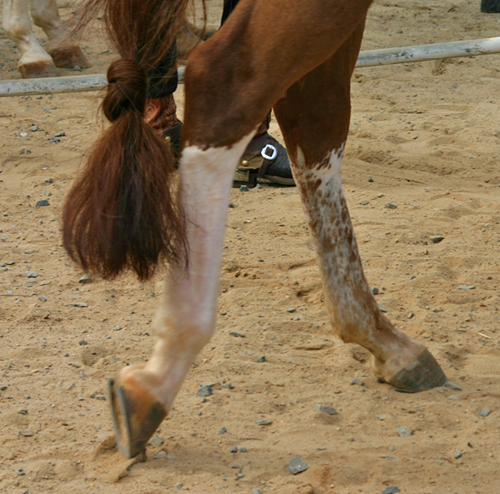 These are the legs of a red silver pony. 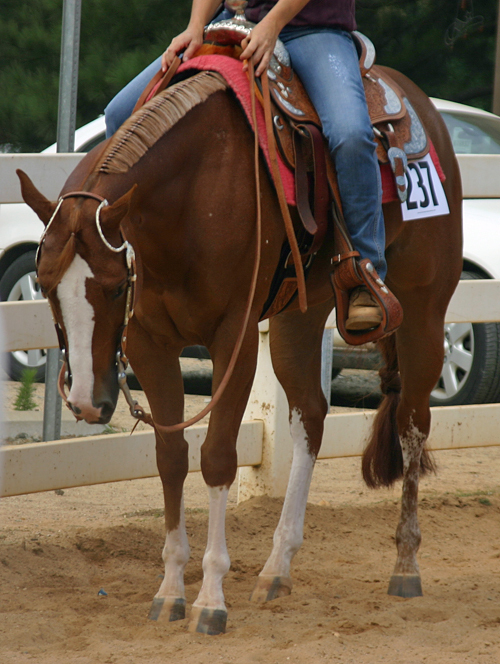 This horse is genetically bay, and you can see the unaltered red hairs on the upper leg. His black lower leg has been diluted by the silver gene, turning it a bluish chocolate. The overall tone on the lower legs is very cool, especially compared to the yellow of the palomino above. And these are Sprinkle’s legs. Again, she’s genetically black so like the silver legs above, this is a diluted form of black. The color isn’t cool, however. It isn’t yellow, but it’s not really red either. If I had to call it something, I would say it is a bronze tone. I would also add that she does not really fade to this color; it’s pretty constant through the seasons. And finally here is Sprinkles’ legs beside a flaxen chestnut leg and a truly black leg, showing the contrasting tones. No one really knows at this point why the pattern dilutes the black on some appaloosas, and of course some aren’t diluted at all. But it does happen with some frequency, and it offers a neat variation for artists painting appaloosas. 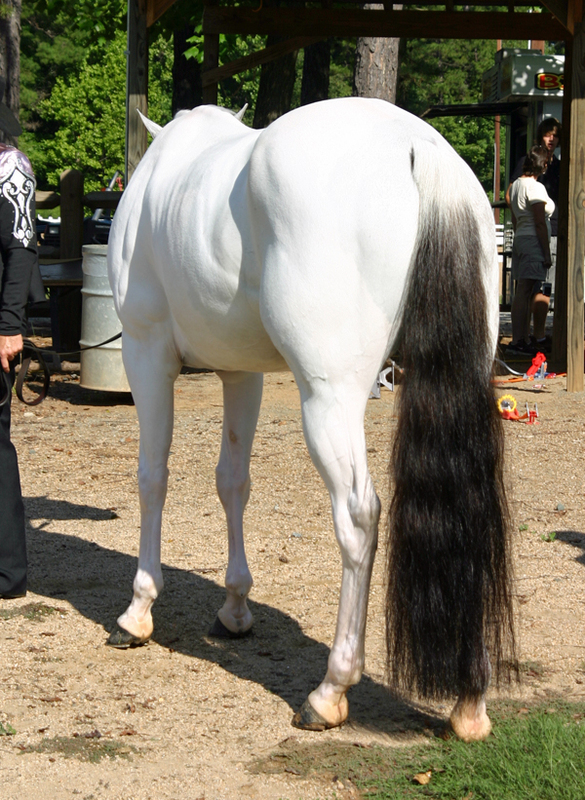 This might look like a very white tobiano, which would explain why the bottom of her tail is so dark. Tobianos, even very white ones, tend to do that. 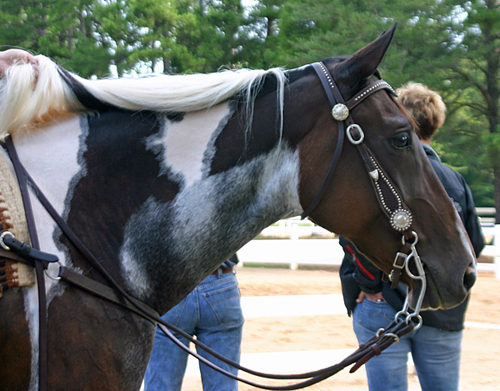 But that’s not a tobiano tail, because her pattern doesn’t include her tail. 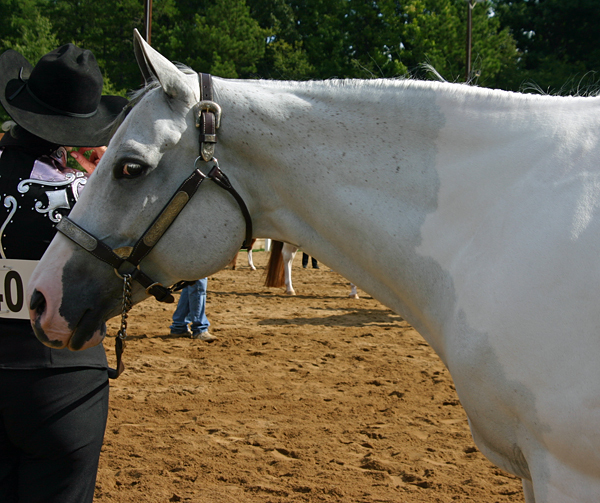 She’s a grey tobiano, and her hindquarters are colored – not white. So that’s technically a grey tail, and grey tails are not supposed to do that. Grey tails typically lighten from the bottom up, rather than from the tailhead down. 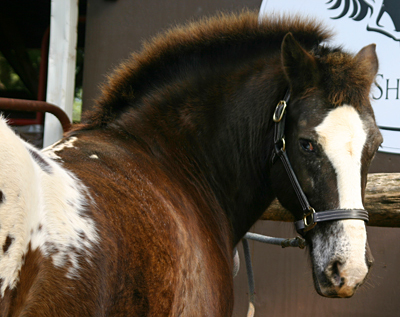 You can see her tobiano pattern a little better here. She’s also a little unusual for having greyed out so quickly; her owner said she had just turned five. 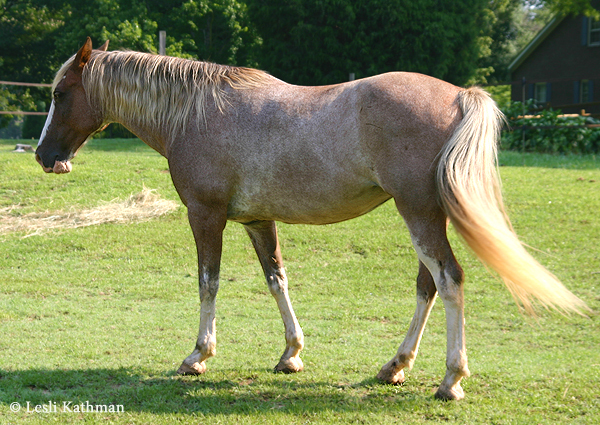 She also said that she was born roan, which might explain why her body greyed out while her tail remained dark. It certainly was striking, and I noticed a number of onlookers comment that they had not seen a grey horse with such a dark tail before. "I know they are popular, but it's not like you can put kissy-spots all over his face like that. It's unrealistic!" My oldest son, Brandon, likes rules. He’s not the kind of kid that is tempted to test the limits or stray from what he is told. In fact, he tends to view mere suggestions and loose guidelines as rules. Most adults, when they encounter children like this, think of them as “easy”. It certainly does mean fewer parent-teacher conferences! But if you haven’t lived with it, it’s easy to overlook the downside. Because rules are comforting to kids like Brandon, they are always looking for them, and they often assume rules based on too few data points. (“If I have not seen someone do this thing, then this thing must be prohibited!”) They also tend to apply hard rules to areas where looser guidelines are more appropriate. As a parent I spend a lot of time encouraging my son to examine what he suspects are rules, and to look for exceptions. I don’t want his world to be narrower, more constrained, than necessary. There are a lot of non-traditional solutions out there, and sometimes taking advantage of them requires just a bit of uncomfortable rule-bending. Pointing this out on a frequent basis has made me more sensitive to my own devotion to rules. (I know all too well just where he got this trait.) My desire to impose a structure on things, and my tendency to look for clues that might reveal hidden rules, helped me to understand coat color patterns. But like all lovers of rules, I have to recognize that the world is a lot messier than simple rules allow. Painting horses – particularly patterned horses – without any thought for the rules would obviously result in some unrealistic pieces. What isn’t so obvious is that painting horses strictly by the rules, without any bending, results in overly stereotyped patterns. Knowing pattern rules, I am not at much risk of producing an unrealistic pattern. What I have to guard against is producing patterns stripped of the little idiosyncrasies that give the impression that I am painting a specific horse, somebody’s horse, rather than an artist’s rendering of a given color. So here are some painting errors, courtesy of some of the unrealistic horses I met. "Some tobianos have random roan patches, but it's not like they form a ruler-straight line that bisects the neck in half." "White on sabinos concentrates under the jaw, not on the top of the neck. And it certainly doesn't create a ring around the neck." "The edges of sabino markings are often ticked and indistinct - but just the edges. The whole stocking isn't like that." "Nope, that's painted all wrong. That's a German Shorthaired Pointer leg, not a horse leg." 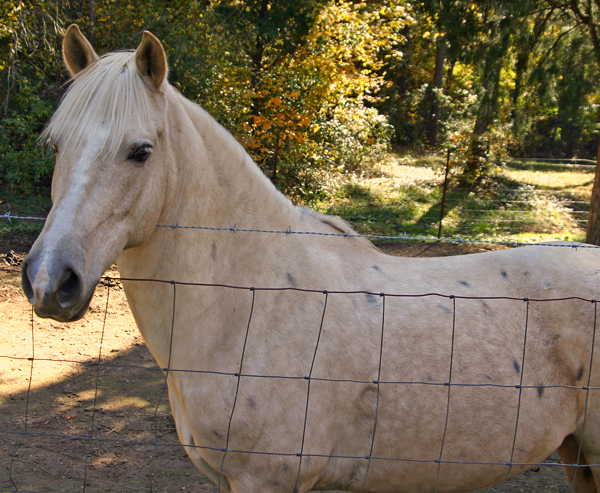 This Morgan gelding, Sky, is the oddly marked sooty palomino I mentioned in the previous post. In this picture where he is darker, it is easy to see that his dark hairs form a pretty typical sooty pattern with the dark knees, dappling and ear rims. He even has the dark ridge along the leading edge of his cheek. If you look closer, though, you can see some slightly darker areas on his barrel and hip. 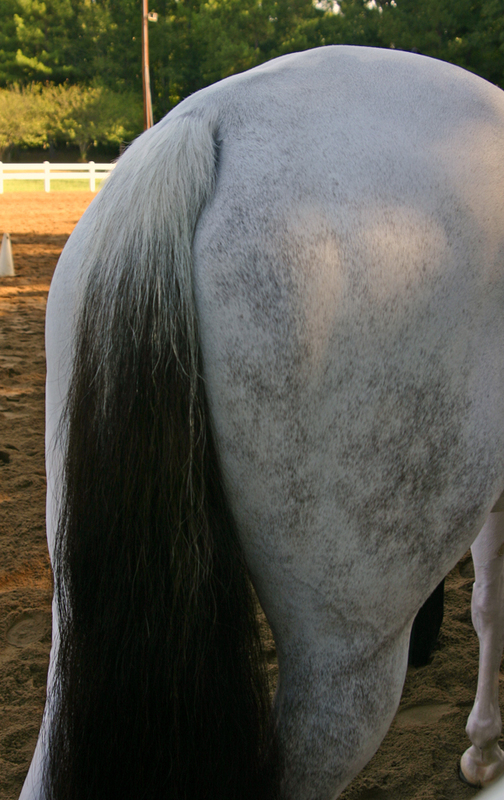 The pattern of the dark hairs is very reminiscent of those seen on blood-marked fleabitten grey horses. It’s also interesting that whatever is concentrating these dark hairs into patches, it hasn’t disrupted the dappling pattern. That’s also true on Prince (the horse posted yesterday), though he is much paler so his dappling – which is obvious in person – doesn’t tend to show up in pictures. Here is the other side of Sky, showing that his odd markings are not evenly distributed. That kind of asymmetry is typical in blood-marked greys, too. Although it isn’t really related to his odd coloring, Rebecca said that Sky had another unusual quality. He’s a gaited Morgan. What a really cool horse! 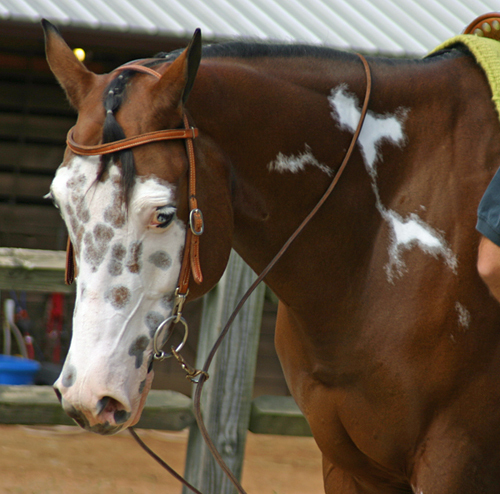 He’s also most likely carrying the splash overo gene. It might be hard to see in this photo, but this right eye is partially blue. His muzzle is interesting, too, because that isn’t mottled skin. It’s actually white hair on dark skin, and it only appears on this one side. The other side is dark. My camera had a hard time capturing them, but he also has really pronounced reverse dappling. Jag has had me thinking about how much the horse world has changed in recent years. He brings the number of appaloosas at our barn up to five. We also have four pintos and six palominos, but only three bays. For years the common complaint in the model horse community has been that we have a disproportionate number of “odd” colors, unlike the real world where most horses are bay or chestnut. It does seem that this has been changing somewhat.